Home / 2017 / April / 10 / It’s Not About Profits … It’s connections. 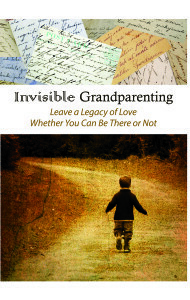 Recently I’d been feeling depressed about how little returns there have been for the time, energy and money I’ve invested in getting my book INVISIBLE GRANDPARENTING “out there.” and how much more work there is to do to even get close to breaking even. Then things like this happen. A woman who’d taken a workshop I’d given five years ago came up to me at a Gala I was attending. “And your book kept me sane by writing those letters that I never sent,” she said. I wondered if I should tell Alienated Grandparents Anonymous (AGA) that has chapters in 50 states and 12 countries to add another reconciliation to the 80 they’ve facilitated in 3 ½ years. Another set of grandparents just called to meet me who said they couldn’t wait for the monthly AGA support group I run at their church. They took me to dinner to tell me their story. After this grand-mom had driven 50+ miles each way twice a week to babysit a one and three-year-old so her 20-year-old step-daughter could work two days a week, they’d recently gotten an ultimatum from the son-in-law, a video game programmer in Silicon Valley with control issues for sure, that they could visit no longer. There were weird stories of not the grand-mom, but the son and daughter confining/strapping the kid to an upright position to sleep that was medically unnecessary after a certain point in time. Last Christmas Grand-dad had dressed up and even played Santa Claus. Now they’d been cut off completely from any contact. While I know there are two sides to every story and then the truth, I pointed them in the direction of help. I am not a professional counselor in this area of estrangement, nor do I want to be. They bought my book and told me God must be working through me to have identified and “branded” this painful phenomenon that happens far more often than we realize. A $12 check came from Bookshop SantaCruz for 60% of my Audio Book arrived in yesterday’s mail, and Amazon royalties, though they range only from $7 to $70 a month, do get direct deposited every month, even though my social media work to drive traffic to my website or Facebook pages, is limited at best. So I must be doing something right. And that said, I must make a BOOK PROMOTION PLAN. Clearly with this first book, one that ‘wrote me,’ that I never expected to write, promotion is not about profits. It’s all about the connections like these, and the love, the healing that does take place when people hear of my journey and are able to voice their own. Thank you god for getting me this far. You are manifesting my intention: My voice on the highest level, to do the greatest good, (for maximum reward and most fun I added later). It is happening.